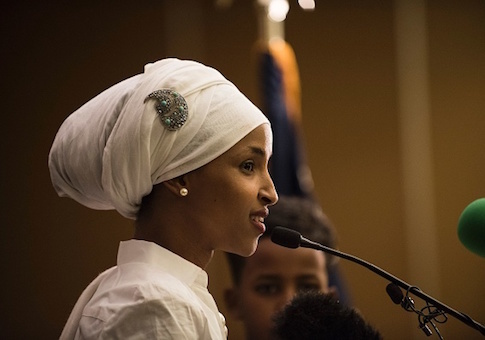 Rep. Ilhan Omar (D., Minn.) acknowledged Tuesday that her defense of a 2012 tweet, in which she now admits unknowingly having used an anti-Semitic trope, was "unfortunate and offensive." In November 2012, before running for Congress, Omar claimed in a tweet that Israel had "hypnotized the world" to hide its "evil doings." Omar previously maintained during her campaign and media appearances since her election that criticism of her tweet was "without merit." In a series of tweets Tuesday, however, Omar expressed regret for using the term "hypnotized." She framed her response in the context of an op-ed from Bari Weiss in the New York Times. Weiss explained that Omar was following "the template for the anti-Semitic conspiracy: the ability of this tiny minority to use its wiles and its proximity to power to con others into accomplishing their evil ends." In response, Omar agreed with Weiss that she had been "sincerely befuddled and not simply deflecting." "Perhaps Ms. Omar is sincerely befuddled and not simply deflecting"
When previously pressed about the tweet, Omar accused those offended of themselves being bigots. "These accusations are without merit," she said during an interview with ABC News in July. "They are rooted in bigotry toward a belief about what Muslims are stereotyped to believe." Omar's stance on the Boycott Divestment and Sanctions movement directed at Israel has also come into question. She expressed opposition to the BDS movement during her campaign but reversed course once elected. The Jewish Daily Forward described the "change in tune" as "a bait-and-switch to many Jewish Minnesotans." The Anti-Defamation League considers "many of the founding goals of BDS" to be anti-Semitic. Following Omar's deception, the ADL called on her to "clarify" her views on the boycott. On Jan. 17, Omar was asked about the hypnosis tweet during a CNN interview. With the tweet displayed on screen, CNN's Poppy Harlow asked Omar what she would say "to Jewish Americans who find that deeply offensive." At the time, Omar held her ground. "Oh, that's a really regrettable way of expressing that," Omar said of Harlow's question. "I don't know how my comments would be offensive to Jewish Americans." In Omar's full response Tuesday, she acknowledged she had spent too much time trying to contextualize the tweet and not enough time "disavowing the anti-semitic trope I unknowingly used." In all sincerity, it was after my CNN interview that I heard from Jewish orgs. that my use of the word "Hypnotize" and the ugly sentiment it holds was offensive. That statement came in the context of the Gaza War. It’s now apparent to me that I spent lots of energy putting my 2012 tweet in context and little energy [to] disavowing the anti-semitic trope I unknowingly used, which is unfortunate and offensive. Like #MLK90, I unapologetically believe "Mankind must put an end to war or war will put an end to mankind." It is important that when you see oppression taking place – when you see our values being attacked as humans – you stand up, and it doesn't matter who the inhabitors[sic] of that particular region might be. In her piece, Weiss explained why criticism of Israel could often operate as an extension of anti-Semitism. Since "the biggest ‘Jew' today in the demonology of modern anti-Semitism is the Jewish state, Israel," Weiss said that "criticisms cross the line into anti-Semitism when they ascribe evil, almost supernatural powers to Israel in a manner that replicates classic anti-Semitic slanders." In her admission, Omar never mentions the word "Israel." This entry was posted in Issues, Politics and tagged Anti-Semitism, Ilhan Omar, Israel. Bookmark the permalink.